As my previous post shows, I have been thinking about Finland’s obsession with unit labour costs (ULC) again, for a change. This is in many ways a crucial topic, as many people in the strong labour movement, at least regarding the export industries, seem to fairly uncritically regard this particular statistic. My thinking has been shaped by what Bill Mitchell has written in blogs and his latest book, as well as Merijn Knibbe’s article on the topic. The core of those writings is that unit labour costs are a highly unsuitable way of measuring “competitiveness”. This really shows in the Finnish public debate. 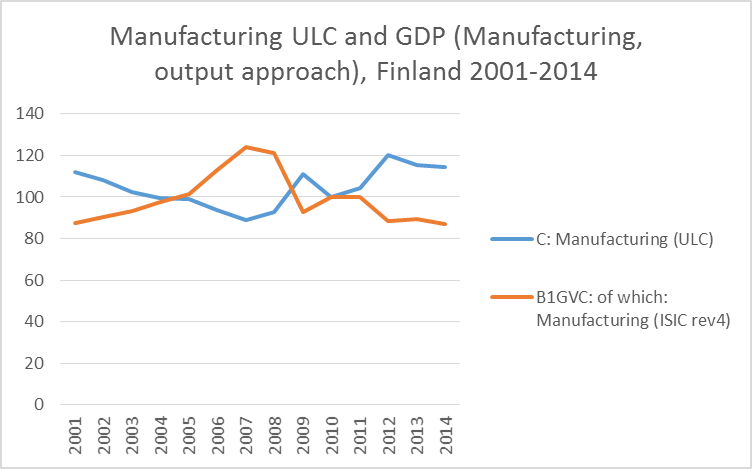 We have for years heard how Finnish competitiveness has suffered (since 2008), especially due to too high wage increases in 2007-2009 and how this shows in graphs of the ULC. This is especially a dominant theme in the export industries. Lo and behold! They are almost exactly their mirror image! This should be obvious to anybody who understands what ULC is (i.e. a ratio). As is very clear to see, as long as the manufacturing sector was doing well (until 2007) ULC declined. Then came the crisis (Lehman, Eurocrisis) and exports suffered (in particular affecting the manufacturing sector). As is known by now, Finnish exports are not in any way booming (i.e. after 2012 not much change) and this also shows – ULC also shows little change. What does this tell us? For one, that it is useless to go after a 5%-decline in ULC across the line, because for the manufacturing sector you would need serious growth to achieve that. (for the rest of the fallacy of this policy idea I suggest to read Bill Mitchell’s blog post). Furthermore, I hope it is now finally clear that ULC is ratio that is rather heavily affected by changes in GDP, which for Finland is quite dependent on demand in Europe and the world and on the other hand on domestic demand.